It is one thing to solve problems; it is entirely another thing to prevent them. So much of the way we navigate life is directly related to our self-esteem. Whether it is problems in school, work, relationships, home or family, the way we deal with life is completely dependent on how we feel about ourselves – and, that can change daily! As we began work on The Soulutions Projectwe realized that Caitlin’s mission to empower women and girls really is the self-esteem building, “preventative medicine” to getting caught up in our problems. Think about it – the better you feel about yourself, the better equipped you are to handle life. Caitlin’s highly anticipated Tween book, Operation Beautiful: One Note at a Time, presents a proactive Soulution for girls to feel better about themselves and the beauty they have within. It covers a range of topics from friendship and parents to puberty and healthy living, featuring graphically beautiful notes written by real girls from all over the world, alongside stories of how writing and finding these notes has changed their lives. It even has journal pages so readers can express their own thoughts. We urge all of you to buy this book for any and every young girl you know. 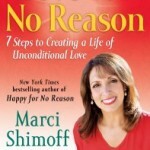 This week’s Soul Food is inspired by Marci Shimoff, #1 New York Times bestselling author of six of the bestselling titles in the Chicken Soup for the Women’s Soul series as well as runaway hits Love for No Reason and Happy for No Reason. She is an acclaimed authority on success and happiness, and is a featured teacher in the international movie and book sensation The Secret. Marci’s expert advice and wisdom work real magic – read on to learn the impact it had on us, and the way it can help transform your life.